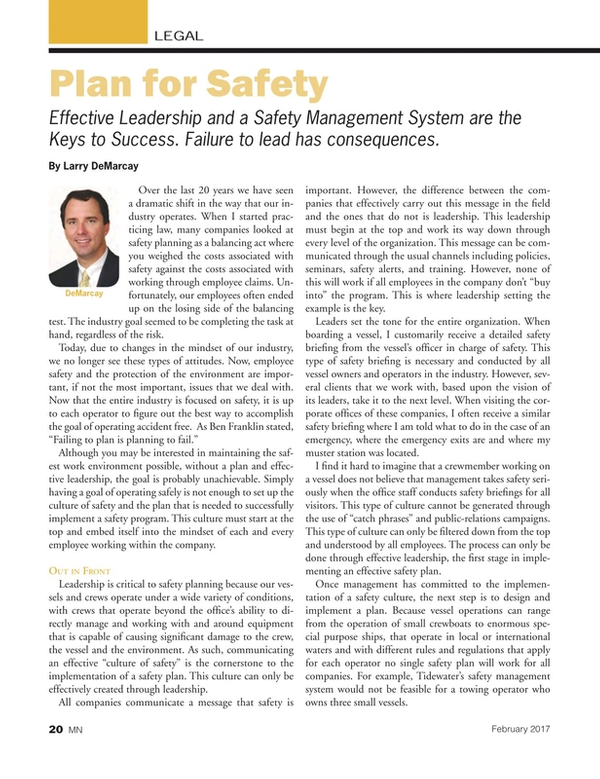 Effective leadership and a safety management system are the keys to success. Failure to lead has consequences. Over the last 20 years we have seen a dramatic shift in the way that our industry operates. When I started practicing law, many companies looked at safety planning as a balancing act where you weighed the costs associated with safety against the costs associated with working through employee claims. Unfortunately, our employees often ended up on the losing side of the balancing test. The industry goal seemed to be completing the task at hand, regardless of the risk. Although you may be interested in maintaining the safest work environment possible, without a plan and effective leadership, the goal is probably unachievable. Simply having a goal of operating safely is not enough to set up the culture of safety and the plan that is needed to successfully implement a safety program. This culture must start at the top and embed itself into the mindset of each and every employee working within the company. Leadership is critical to safety planning because our vessels and crews operate under a wide variety of conditions, with crews that operate beyond the office’s ability to directly manage and working with and around equipment that is capable of causing significant damage to the crew, the vessel and the environment. As such, communicating an effective “culture of safety” is the cornerstone to the implementation of a safety plan. This culture can only be effectively created through leadership. All companies communicate a message that safety is important. However, the difference between the companies that effectively carry out this message in the field and the ones that do not is leadership. This leadership must begin at the top and work its way down through every level of the organization. This message can be communicated through the usual channels including policies, seminars, safety alerts, and training. However, none of this will work if all employees in the company don’t “buy into” the program. This is where leadership setting the example is the key. Leaders set the tone for the entire organization. When boarding a vessel, I customarily receive a detailed safety briefing from the vessel’s officer in charge of safety. This type of safety briefing is necessary and conducted by all vessel owners and operators in the industry. However, several clients that we work with, based upon the vision of its leaders, take it to the next level. When visiting the corporate offices of these companies, I often receive a similar safety briefing where I am told what to do in the case of an emergency, where the emergency exits are and where my muster station was located. I find it hard to imagine that a crewmember working on a vessel does not believe that management takes safety seriously when the office staff conducts safety briefings for all visitors. This type of culture cannot be generated through the use of “catch phrases” and public-relations campaigns. This type of culture can only be filtered down from the top and understood by all employees. The process can only be done through effective leadership, the first stage in implementing an effective safety plan. Once management has committed to the implementation of a safety culture, the next step is to design and implement a plan. Because vessel operations can range from the operation of small crewboats to enormous special purpose ships, that operate in local or international waters and with different rules and regulations that apply for each operator no single safety plan will work for all companies. For example, Tidewater’s safety management system would not be feasible for a towing operator who owns three small vessels. You can start formulating your plan by determining the plan components that your operation requires. For larger vessels, the requirement for achieving ISM Safety Management System Certification provides an excellent blueprint for formalizing your safety program. For tow boats and barge operators, the American Waterways Operators’ (AWO) Responsible Carrier Program provides an easy to implement safety management plan that has already been tailored for your segment of the industry. If you are not up to speed with the applicable laws, regulations and recommended practices, you may want to start the process by meeting with your attorneys or a safety management consultant to determine where to start. The requirements for ISM certification and compliance with the AWO’s Responsible Carrier Program are similar and require appropriate management, policies, vessel equipment, adequate crew and an audit of the program to determine its effectiveness. According to the ISM Code, each certified Safety Management System must include: a commitment from management, a comprehensive policy manual, a comprehensive procedures manual, audit procedures, a dedicated employee who serves as an ombudsman between the vessel crew and the office staff, a system for identifying problems with implementation and regular management reviews. Once you have started the process of implementing the safety culture and a workable plan, you are on the road to improving your safety record. At that point, effective implementation will be achieved by continued leadership and the effective management of the plan. The worst safety mistake that you can make is to have a safety plan and then choose not to implement it or worse, just ignore it. In the event that an accident occurs, the claimant’s attorney will request all of the documents related to your safety plan. Having to admit that you didn’t have a safety plan is a painful event, but producing a plan that was ignored by either management or the crew may prove to be worse and expose your company to an excessive judgment. It is important to note that the development of a safety culture and the formulation and implementation of an effective plan takes significant time and resources. This is a project that will absorb significant resources without showing an immediate result. However, if you stick with your program and continue to communicate and manage the plan effectively, it will pay significant dividends for your organization over the long term. These long term benefits include an improved safety record, more satisfied employees, operational savings due to less downtime and an improved bottom line due to reduced insurance and claim expenses. Larry DeMarcay is a partner in the law firm of Fowler Rodriguez Valdes-Fauli. His areas of practice include commercial litigation, admiralty, personal injury, transportation, real estate, construction and corporate law. Prior to attending law school, DeMarcay served on the Washington based legislative staff of Congressman Jimmy Hayes.